Summary: The ZGT Z10 from FitnessForm is a compact hybrid cross trainer plus exercise bike. It is plenty big enough for home use – though does not compare in size to the models you’ll find in the gym. The Z10 uses a 5KG cast iron fly wheel, plus magnetic (smooth) resistance. A unique seat configuration allows you to adjust your position for maximum comfort while you pedal. Reviews have been very positive – and (at the time of writing) there is a serious discount on the RRP over at amazon.co.uk. Check this dedicated product page for the latest discount. As hybrids go, this is a smart looking compact unit. Many people worry about the size of elliptical trainers (and rightly so, some models are huge!). The ZTG Z10 from FitnessForm measures only 98cm tall, 45cm long and 23cms wide when assembled. The boxed weight is 33kgs. You can move it around on small wheels attached to the rear support strut. Being a smaller model, the maximum user weight has to be lower than on some bigger elliptical trainers. In this case it is 110 kgs, which is still a generous 17.3 stone. The stride length for the cross-training mode is 12 inches. Again, plenty for most people – if you are over 6 foot then you might want to consider a bigger model. The seat is a selling point for the ZGT Z10. This is adjustable both horizontally and vertically. You’ll find this useful when finding the ideal position for cycling. Obviously, you’ll be standing for the cross-training mode. A cast iron 5.5kg fly wheel is at the heart of this machine. This has two-way rotation, so you can pedal backwards as well as forwards! The flywheel is friction free, so as you adjust the resistance this should be both consistent and smooth. The display is simple, with clear bold numbers. This shows all the usual speed, distance and time factors – and features an in-built pulse sensor. Some assembly is required for this FitnessForm machine – though there are no major complaints about this from previous buyers. 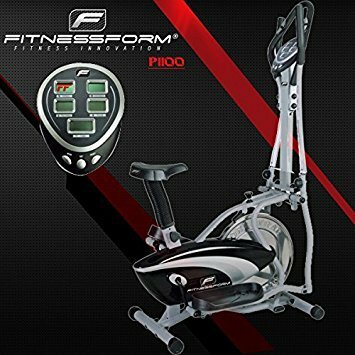 The FitnessForm Z10 Cross Trainer / Bike – What Previous Buyers Said? While not quite glowing, the comments are overall very positive for this machine. A lot of people commented that they got a nice machine for the selling price. When you compare other models in a similar range, the spec and quality does support this. Many buyers used words like ‘Sturdy, ‘Stable’ and ‘Solid’ in their feedback. One interesting comment says that the bike is fine… though does not come complete with the motivation to use it! Overall, it is the discount which swings this model from being a fair mid-range 2-in-1 cross trainer / exercise bike to being a top-quality model for the (low) price. Discounts do change / disappear, so you’ll need to make sure this is still in place before pulling the trigger. You’ll get a compact cross trainer, which will not take up half of your spare room and can be moved around on wheels. The smooth resistance (magnetic flywheel) and comfort from having a fully adjustable seat are the big pluses. On top of that, the FitnessForm ZTG Z10 looks great too! Check out this dedicated product page over at amazon.co.uk – and see if that big discount is still in place!